I decided to begin my tour on East Pettigrew Road; little did I know that this would be one of the most economically depressed areas I would visit. I noticed that I was entering an area less developed than Main Street and its surrounding crossroads, especially after crossing under the train tracks on Roxboro. The entire left side of the street followed train tracks, dead grass bordering the curb up the hill to the train. The right side of the street at Roxboro did have a sidewalk, which I followed past the Venable Center, seemingly a tobacco building recently converted into office space. I felt alone but rather safe in this area. It was not until I crossed the intersection of the on/off ramps of Highway 147 that I felt the area changing. The road became more beaten up, probably due to the fact that large transport trucks use Pettigrew as their route (denoted by signs) and houses built along the highway seemed neglected. 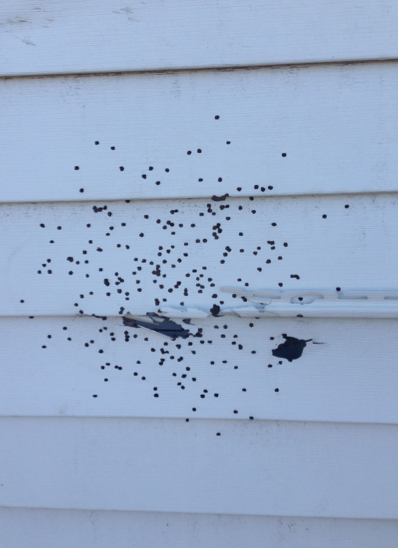 I walked past a house (one of many) that had been boarded up and whilst vacant had been vandalized with a BB gun (Appendix A1). It was perched on stacks of brick (Appendix A2); perhaps it was a mobile home, where grasses and plants had begun to grow in the area where a porch had once existed. Yards consisted of patchy brown and yellow grass that faced the train tracks on the opposite side of the street. At some point a train came tumbling down the tracks blaring its deafening horn – this would not be a comfortable place to own a home. Based on conditions of homes and types of businesses in the area, I could hypothesize that this was a low- income area of people of color. Businesses included a hair salon, possibly closed forever, named “Chloe’s too – a little touch of soul”, a tattoo shop named “The Inkwell – Tattoos that Hurt So Good”, a tire shop, “Llanteria Padilla – New and Used Tires”, and a taquería. The only people I had seen were two African American women walking a baby in a stroller, two Caucasian men cutting a tree branch way from power lines, and three African American men smoking outside the Brenntag building. to clean their lot of debris. Cars were mainly old trucks and sedans. I did see one early 90s sedan that had a hydraulic system installed (Appendix A3), or was raised, and had been painted Tar Heel blue and had UNC flags flying off its windows. An African American man rocking on his front porch stared at me as I walked up the street. Another yelled something incomprehensible at me as I walked past him. I passed a two bedroom, one bath, 865 square foot house for sale on Liberty and Maple at $35,9001. Spruce Street felt much the same as Maple, though one might say the homes were a fraction nicer. A large church, the We Church, owns a stretch of the left side of Spruce Street, giving a sense of more space that Maple did not possess on this particular block. The houses that existed on the whole stretch of Spruce, however, were quite close together. I did not see any construction/remodeling of houses in this neighborhood. It seemed to be a lower-class African American neighborhood. This had to be one of the most interesting neighborhoods I had visited on my tour. A friend’s girlfriend lives in this area and she had told me that gentrification was occurring. House prices ranged from $14,100 (610 Canal St., right on the other side of Elizabeth) to $299,900 (604 Primitive St., originally $315,000 and two blocks from 610 Canal St.)2 and there was construction/remodeling on a good number of houses (Appendix A4). The neighborhood consisted of more raised foundation, older homes placed close together much like those on Maple and Spruce, however these seemed to be kept in better condition. I saw a mix of older African Americans and younger Caucasian residents; perhaps this is an area transitioning from a lower income, uneducated neighborhood to one that is more educated. On Geer Street houses were a tad more spread out than the other neighborhoods I had been in, but they were still of the craftsman or Tudor style. On most of Geer St I saw many signs for businesses in Spanish. The area consisted of a mix of craftsman and mid-century modern homes in okay condition. 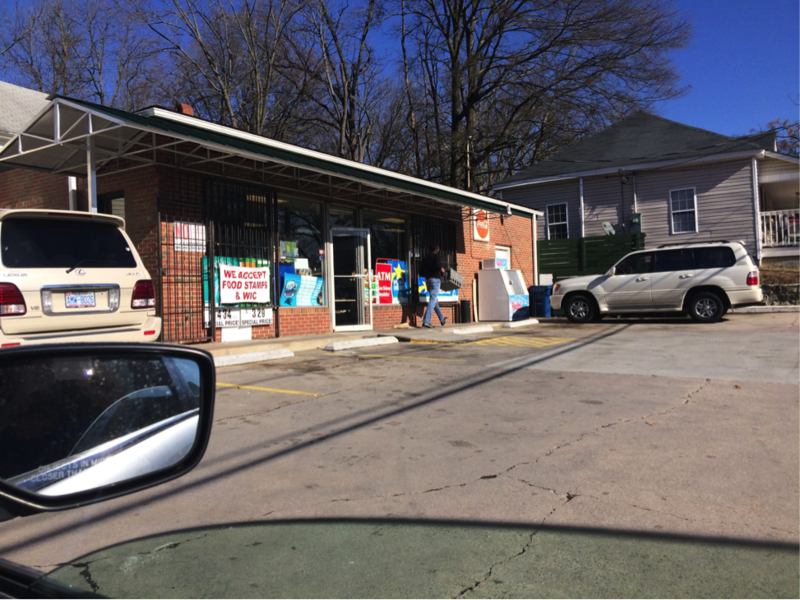 At the corner of Roxboro and Geer I noticed a mini-mart that advertised that it accepted food stamps, suggesting that this was not a high-income neighborhood. Cars were older, mid-range brands and there was a mix of all races from what I could see. Nearby there were three identical homes boarded up, all next to each other. Arriving near Washington Street I noticed a Latino market on the right, soon after Motorco on the left and a crossfit gym further down. 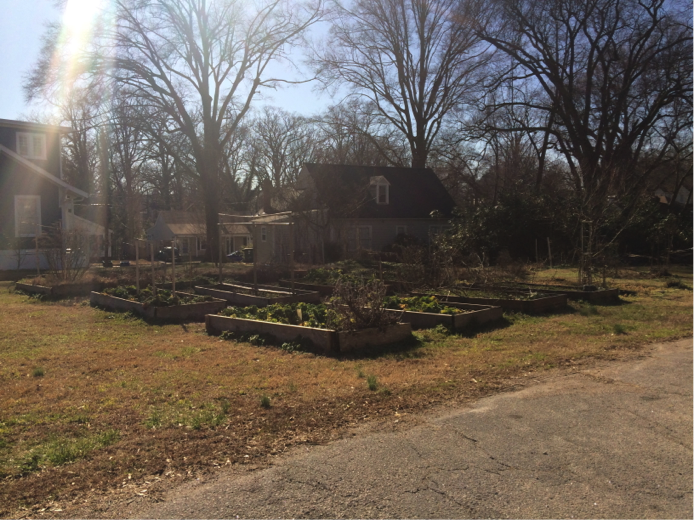 It is clear that this stretch of Geer closer to downtown has been commercialized and gentrified. I felt as though this area had been gentrified, because although it was bordered by a lot of apartment buildings on Trinity Avenue, most of the older homes were in relatively good shape. There was the occasional house that was falling apart and in need of redoing, but for the most part it seemed that most homes had been renovated. On the corner of Trinity Avenue and Washington Street an African American woman stopped me and asked me for a bite to eat (again I could not understand her the first time). I entered into the west part of the neighborhood at this point and houses were very small on small lots. Despite the area’s name “Old North Durham” the houses on the west side seemed newer, perhaps from the 50s, 60s, or 70s. It was a quiet, treed neighborhood without train and highway noise. I saw a younger Caucasian man walking his dog here. Cars seemed to be mid-range, older sedans for the most part. 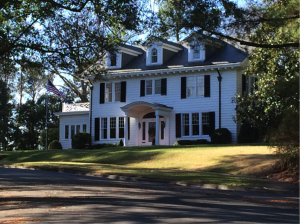 It was not until I made my way over to Mangum Street that I encountered the more stately southern Victorian and craftsman homes. These were intermittently mixed with smaller homes. It seemed to me that an educated, lower middle class population and/or a middle-class population inhabited this neighborhood. Weaver Street at its intersection with Cornwallis Road began with apartment complexes spread out far from each other by grass lawns and parking lots. They seemed to have been built anywhere from 1950 to 1980 and seemed to have an African American population, based on my observation of three African American people. Cars in the parking lots surrounding apartment buildings were older mid-range sedans. After passing this group of apartments and a stretch of woods I came upon a development of split-level homes that seemed to be built around the same time as the apartment complexes down the street. These houses were of medium size on larger lots and tended to be rather colorful. I noticed again that many residents were African American and that cars tended to be middle of the road and of varying size. 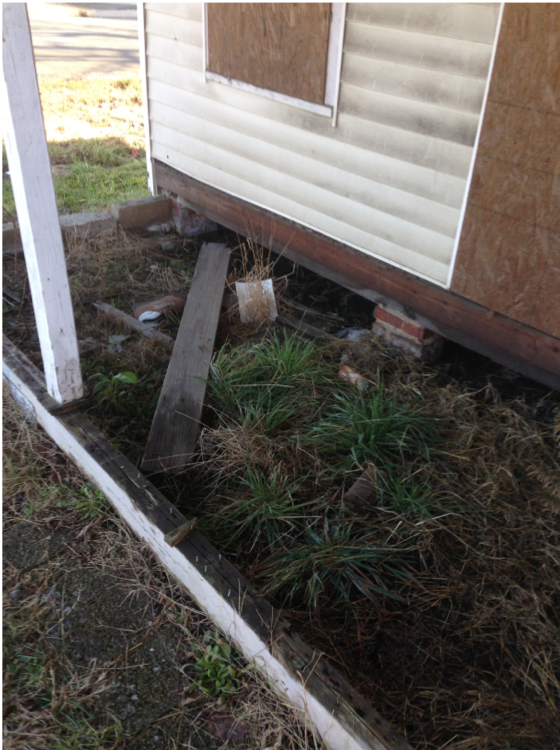 Some roofs were in need of work as they were sagging, and I did notice an older house that had been boarded up. The street came to a dead end and backed up to a forest, allowing the last residents on the street breathing room. Perhaps people of the lower-middle class inhabited this area. The majority of buildings on campus were very new, perhaps built within the last ten to fifteen years. The campus was spotless: buildings were very well maintained and their large glass windows were kept clean. The grass lawns were also green relative to those that I had seen in other neighborhoods. There was a large, beautiful football field and track fenced from the outside road (as is the entire university). Cars seemed to be newer mid-range sedans, coupés, or older luxury sedans. I noticed a very large African American population at the university. I visited on a Friday when classes were in session with plenty of students to be seen and I counted three Caucasian students during the time I spent there. Houses surrounding the university were simple but in good condition. I noticed a mix of craftsman and mid-century architectures. I would guess that the population here consists of perhaps a lower-income, educated population, such as students. South Street was rather close to NCCU’s campus, however there was quite a large change upon entering this neighborhood. I saw four individuals in this neighborhood, three of which were Latino. The houses were older and run-down, some even had bars protecting their windows and doors from break-ins, and others were boarded up. 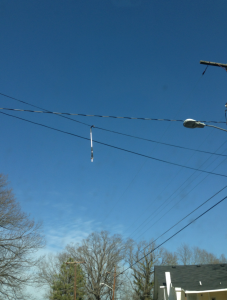 As my friend drove me up the street, she pointed out a broken umbrella hanging from power lines outside of a duplex (Appendix A5). Being from Los Angeles, I had seen objects hanging from power lines many times and I was told that it meant that either a drug dealer was nearby or that it was gang territory. There were small single family and multi-family homes that were placed close together. Most cars were older low to mid- range sedans. 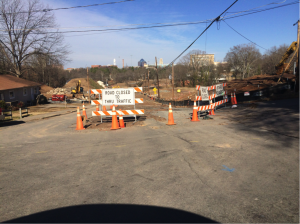 South Street abruptly ended just before University Drive due to construction. Professor Becker added that is an area about to transition to a more stable lower-middle income community. This will be done through a project that encourages home ownership. East Forest Hills Road was by far the most beautiful street that I had visited. Secluded, large homes sat on well-maintained, big lots; even the street wound in such a way to provide privacy to residents. Cars in the area were new mid-range or luxury sedans and SUV’s and some houses had one or more sitting in the driveway. Note this was on a working day, Friday, around 1:30 pm. Perhaps this is a community of families or couples that is wealthy enough for only one spouse to have to work. Houses were perched above the street, giving a figurative message of being upper middle class. I saw one person in the neighborhood, a blonde, Caucasian, young woman decked out in exercise gear. She was walking along the street. Despite being very close to South Street, this community had a completely different feeling. There was also a park that separated the neighborhood from the main street. Kent Street continued the theme of larger wooded lots, however the houses were much simpler and smaller. I noticed ranch and split level homes most likely from the 50s. There was no sidewalk in the neighborhood and I did not see any residents out. These houses were set back from the road thus giving privacy to residents. Based on the newer mid-range cars that I saw and good condition of houses this neighborhood seemed to be inhabited by middle class residents. Speed bumps slowed down drivers on the road and kept the roads safer, suggesting that residents might have younger children living with them. I found Kent Street to be a dividing line of Bivins Street. The west side did not have the bigger, more private lots that the east side of the street had. The houses also became larger as I headed farther east. Homes on the west side were quite small and some were even run down. A large modern home stuck out amidst the smaller bungalows. Some yards were overgrown and others were kept nicely. I saw two older Caucasian women walking a dog on the west side of Bivins turning on Kent Street. Most cars were a mix of old and new mid range cars. I did see one BMW X3 SUV. A strikingly new development of houses on the west side could be seen up a small cul-de-sac and did not really blend in with the neighborhood. Professor Becker added that this is a racially mixed neighborhood that has been gentrified over the past few years. “1108 Liberty Street”. Realtor.com. Accessed January 15, 2014. “Area in 502 Gray Avenue”. Realtor.com Accessed January 15, 2014. A1. 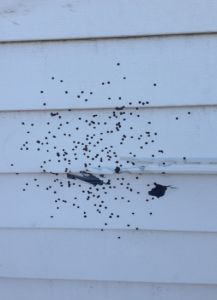 BB gun bullet holes in siding of vacant house on Pettigrew Street. Author’s own. A2. Home sitting on top of stacked bricks on Pettigrew Street. Author’s own. A3. Car on Maple Street with hydraulics and UNC flags. Author’s own. A4. 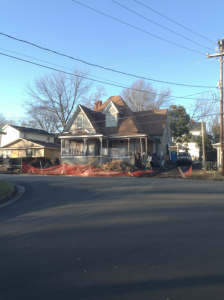 Victorian house being remodeled in the neighborhood between Roxboro, Geer, Elizabeth, and Holloway. Author’s own. A5. 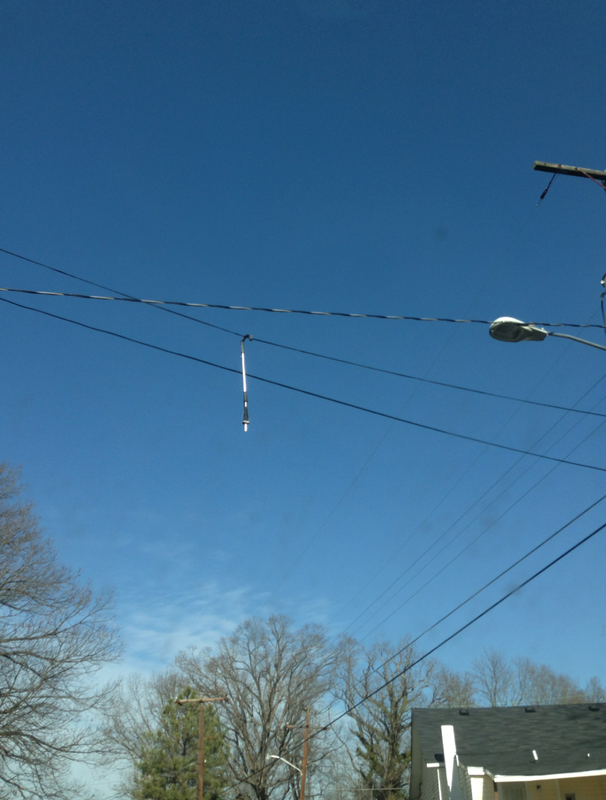 Broken umbrella hanging on power lines on South Street. Author’s own. This area contained some of the nicest houses that I visited, but it also had great disparity in the houses depending upon which side of Cole Mill Rd. the houses were on. 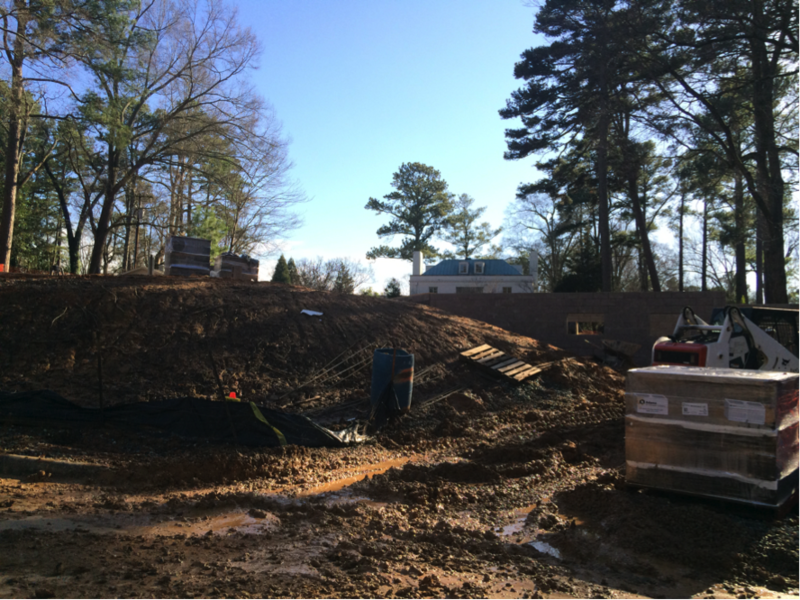 The houses that were on the side of Cole Mill Rd. with the golf house were very nice and sat on large properties. In addition, these houses had very well kept lawns, had ornamental stone decorations, and the driveways had some of the nicer brands of cars. I am not sure if the houses sitting on the golf course made up members of a country club, but I could very easily see this as being the case. 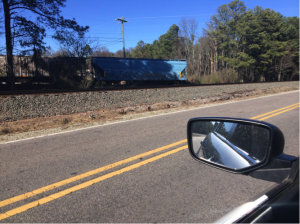 On the opposite side of Cole Mill Rd. the houses were part of a small development called Stoney Brook Cottages. 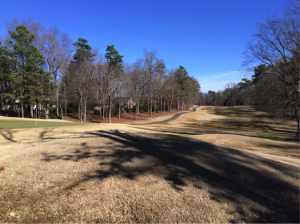 These houses were substantially smaller than the ones that sat on the golf course, but they were still nice houses with much smaller lots and considerably smaller lawns. The majority of houses on both sides of the street were two-story houses. From my own previous experience I know that Northgate Mall is not nearly as nice as Southpoint Mall, which I will talk about later. When visiting the mall it was clear that there are many vacant storefronts throughout the mall, which shows that it is not getting nearly the foot traffic that it was originally expected. The mall does contain a fairly nice movie theater that always seems to be crowded. In the parking lots the cars that I noticed tended to be older models and not nearly as nice as ones seen at Southpoint. In addition, I found the layout of the mall to be a little odd, with very limited views of the actual mall because of parking structures and more recently built buildings. On the backside of the mall there is also a strip mall that shares the parking lot with Northgate. This building also seems to be a little worn-down. Old North Durham was a pretty interesting mixture of decrepit one-story houses and some newer, nicer two-story houses. Some of the really bad houses were clearly vacant as they had their doors and windows boarded up. 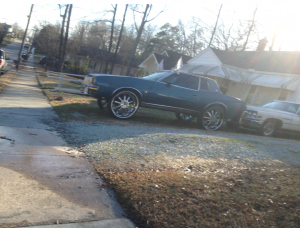 This area also seemed to have nicer cars relative to the houses: I saw two BMWs, two brand new Lexus’ and multiple customized trucks and low-riders. 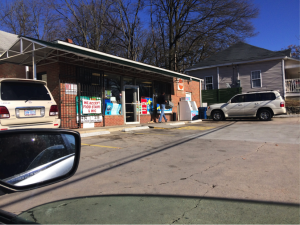 Also when I examined the local convenience store I noticed that it had bars on all of the windows and had a sign hanging outside that said that it accepted food stamps. From this single observation it was easy to tell that this area had undergone some economic hardships. One interesting aspect of this area was that there were a few churches all within a couple blocks of each other. The area also housed a Trosa building, which is a residential option for substance recovering abusers. 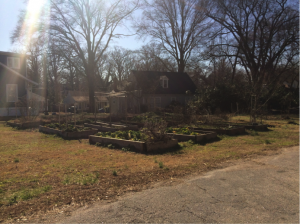 There was also a community garden in the area, which could mean that the area had a larger sense of community than others. This area reminded me slightly of the Old North Durham Neighborhood; it had a few houses that were boarded up with no trespassing signs on the fronts, had customized trucks and cars, and contained mostly one-story houses. Although some of the houses were abandoned and the lots that the houses were on were quite small, people still seemed to keep their lawns very well kept. There was also very little spacing between neighboring houses and also houses and the street. Most of the divisions between houses were just chain-linked fences that were a little taller than waist high. I also saw two different people walking around drinking from bottles concealed within brown paper bags at about 1:00 pm. There were also two schools that were relatively close by one another (presumably a middle and high school) that looked to be old but still well maintained. This was one of the worst locations to live in my opinion because all of the houses on the street were directly across the street from train tracks and on the other side of the train tracks there were multiple industrial buildings. With all of the traffic and noise that these two locations produced the land value of these properties has to be on the lower end. Most of the houses in this neighborhood were single story houses with a couple of nicer two storied ones sprinkled in. Lots of the houses had multiple personal items in the front yard: lawn chairs, children’s toys, jet skis and even a bench press. The presence of the jet skis in two different peoples lots perplexed me, because it shows that people living in this area do have a significant amount of disposable income. Almost all of the houses that had driveways were not paved, but rather gravel drives. Further down the street there was an apartment complex that seemed a bit out of place in the otherwise single story house area. The further down the street you go the more undeveloped the area got and there was even a rather sizeable forest at one end that had yet to be touched. Bivins Street had a large amount of disparity amongst the houses. One end had smaller houses that were primarily single storied, but these houses were all located within a short walk of a fairly large park, which was located at one end of Bivins St. Towards the middle of the street I noticed quite a few modern houses, which is one of the only areas in Durham where I have noticed modern architecture in houses. This modern architecture makes me think that these houses were built rather recently, and that the owner hired a specialized architect to design the houses. In addition, at this middle point of Bivins there were also a lot of overcrowded front yards that contained many different personal items, not too different from the items seen at Location 5. Then at the end of Bivins Street furthest from the park there was a really nice neighborhood that was probably the nicest or second nicest group of houses (other was E. Forest Hills Blvd.). At this end of the street there was one of the only signs of a new house getting built that I saw on my tour of Durham, and from the looks of it the house that was getting built was going to be quite sizeable. To me this was the most interesting place that I visited on the list because it combined so many of the different things that I saw at all of the other locations: a mall, apartment buildings, businesses, shopping centers, houses, and housing developments. 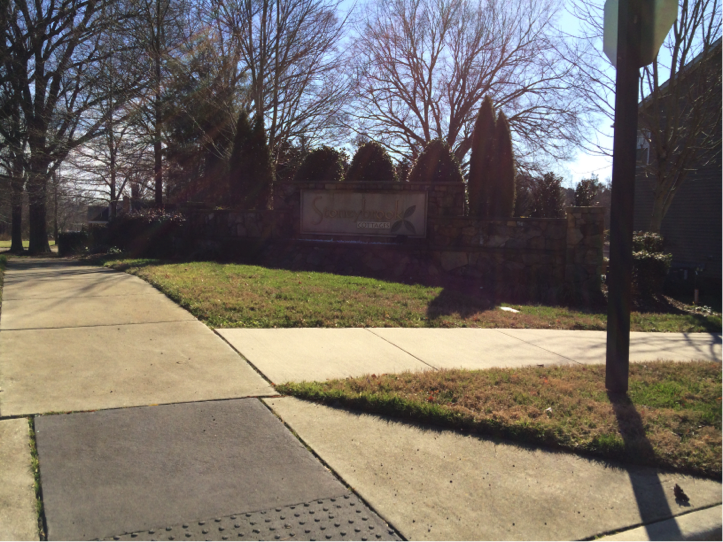 Not to mention that it was the intersection of a freeway and one of the larger roads in Durham. The shopping centers: In this area we have the nicest mall in Durham, Southpoint mall, whose parking lot is full of cars covering the whole pricing spectrum. When driving through their parking lot I saw many top of the line car brands (BMW, Lexus, Audi, etc. ), but I also saw lots of cars that have clearly been heavily used and were a little beat up. Across the street from Southpoint there is a very nice shopping center that has some of the typical mainstream eating places (Buffalo Wild Wings and PF Changs). This shopping center has much nicer shops than the shopping center that shared a parking lot with Northgate Mall. On the other side of 54 the shopping center is a little less nice, but the buildings are all relatively new and very well kept. There was also quite a bit of construction going on further down the road, adding even more commercial storefronts. With Southpoint being so close, and the heavy use of NC 54, I think that this would be the ideal area to open up a new business. Residential: Depending upon which direction you go you find very different housing options. There were new apartment buildings that were in the medium range, and there was also a housing development that was a step down from the housing development seen at location 1. This housing development had cookie-cutter houses that had very small lawns. The housing development seemed like a cheap version of “Suburbia America.” Moving in the other direction from the intersection of Fayetteville and NC 54 there are some small run down one-story houses that lay on large properties. These houses seemed like they could be in a Midwest because of the low elongated architecture that they utilized. 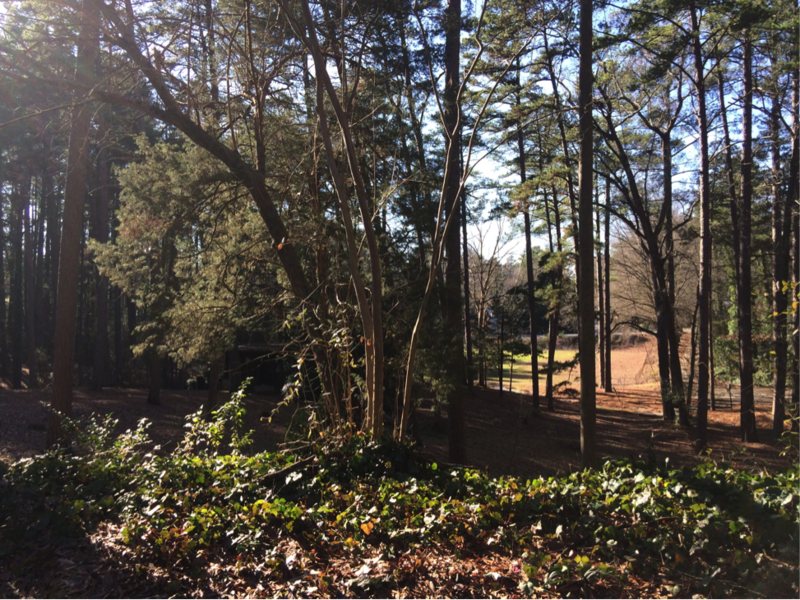 The draw of living here is probably somewhat negated due to the closeness of NC 54 that is only a few hundred yards away from these properties. Businesses: In this area I saw the only real office building area. These buildings were designed so that they might easily be mistaken as houses or apartments, but are in fact actual office buildings. From what I could see from the outside that it looked like most of the offices were occupied by either lawyers or other similar professions. It seemed like these were high-quality places in a good location, because of all of the traffic that would be attracted by the shopping centers in the immediate area. 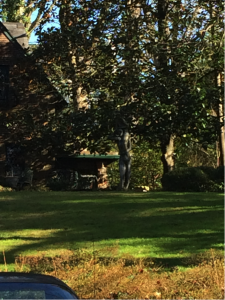 Location 8: E. Forest Hills Blvd. If I had to choose a place to live permanently in Durham, this is the place that I would want to live in. Not only did all of the houses seem to be placed on top of a little hill, but also they all had nice views of Forest Hills Park. E. Forest Hills Blvd. is also very nice because the park has multiple tennis courts and lots of walking and running trails. The nicest thing about this neighborhood was that there were only houses on one side of the street. In addition to not having houses across the street, the properties that these houses sat on were much larger than the other areas that we visited in Durham. There was also much care taken to the appearances of both the houses and the lawns of these properties. 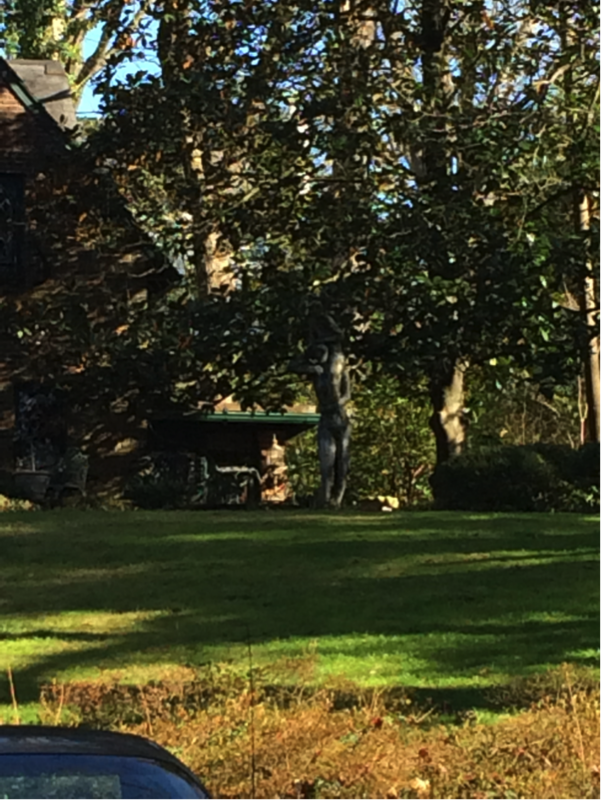 In multiple front yards people had added decorative items or statues. One nice addition that most people had added to these houses were big porches with tables and chairs. 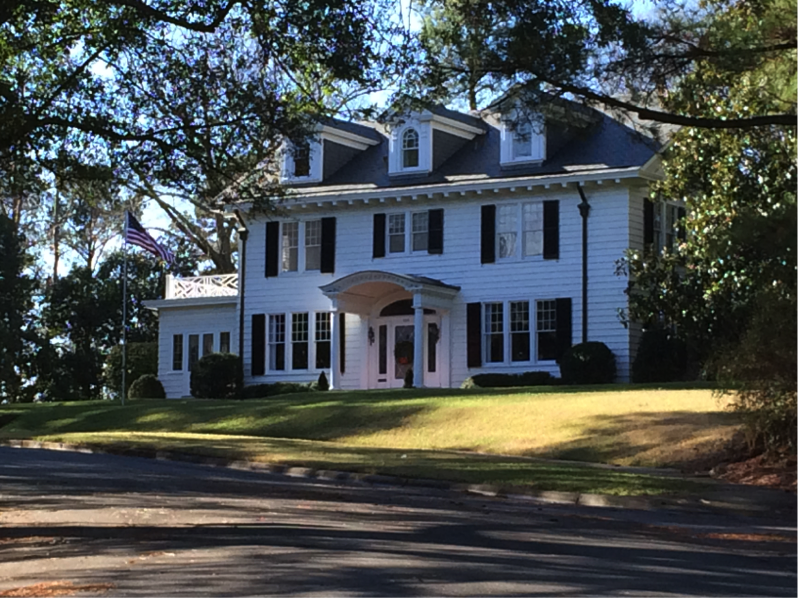 NCCU is located directly within a residential neighborhood. The houses in this area are by no means the nicest houses I saw on my tour of Durham or the worst. Most of the houses are single story houses that are located on small plots of land, but like most of the rest of Durham there are a few two-story houses sprinkled in. The school buildings seem to range in terms of date of construction much like Dukes campus. It is quite obvious that two of the major dorm buildings (or buildings that look like dorms) do not have central heating or cooling, because every window in the building has a window ac unit (this appearance is somewhat similar to project buildings in NYC). Also as would be expected there were tons of people walking around the school and surrounding area. In addition, there were more people hanging out porches in this area of Durham than other areas. All of the buildings on campus are made out of brick, with the professional schools seeming to be the newer buildings because of the color of the bricks and the architecture. 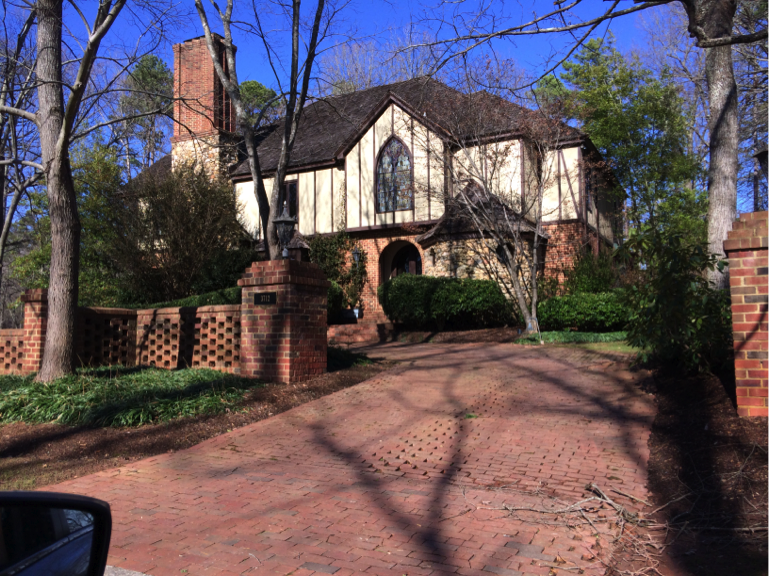 Parkwood neighborhood had the most communal feel out of any of the areas that I visited around Durham. It had a baseball field, church shopping center, and school all named after the neighborhood. 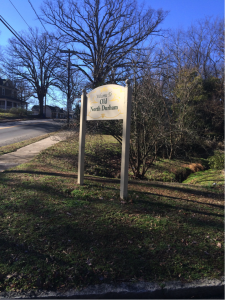 One of the most interesting things is that the Parkwood Neighborhood had a fishing pond that had a sign that said fishing for residents of Parkwood Neighborhood only. There appeared to be some amount of code that all of the houses had to apply to, because all of the houses were extremely well kept even though they were small mainly one story houses. The code is likely enforced by some sort of neighborhood association, which probably increases the value of the properties. Location 11: South St. from Apex to University Dr. This area might have been the worst area that I visited. Almost all of the houses had been boarded up by the Self Help organization and had signs that read no trespassing. In addition, some of the boards used to close the windows had been spray painted to make it look like the houses had not been boarded up. This might be a trick used by real-estate companies to increase interest in the area Other than the boarded up houses there were a few vacant lots that only had the cement foundations of where houses used to be. 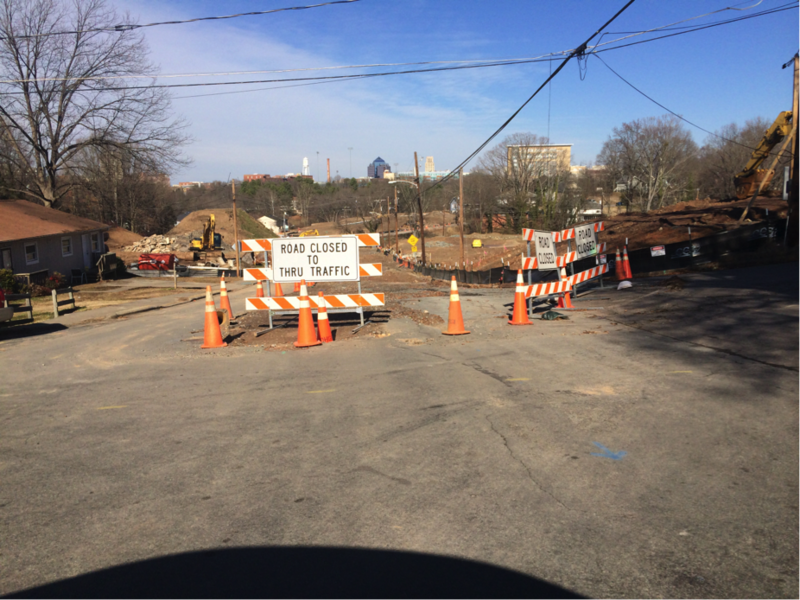 There were also large amounts of construction that was occurring on South St. that completely shut down the road.